Every year for my birthday my family and I have a small celebration at home, and each year I try to add a few extra-special touches to the occasion. Since I have a fabric tablecloth and real dishes especially for my birthday, the look is pretty much set to a spring-y, vintage aesthetic, but this year I wanted to expand on what I had to create a more specific theme. After deliberating between a few options, I settled on a celebration inspired by the Blandings Castle books by P. G. Wodehouse. They were club sandwiches, you see. Puns aside, I thought these little flags looked like something that might come on a sandwich at Wodehouse's Drones Club--the bee motif came from a clip art set I found through a Google image search, and was inspired by the symbol used for the Drones Club in the Jeeves and Wooster television series. 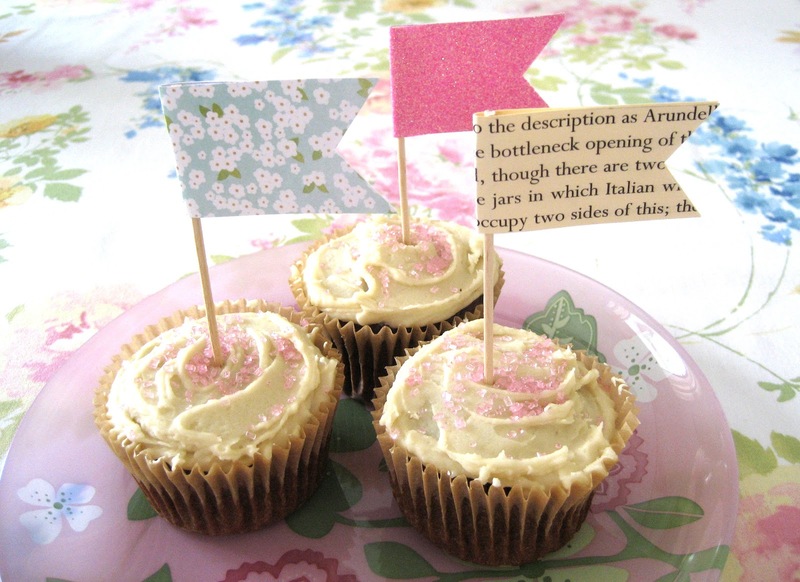 I also made custom cupcake picks, using scrapbook paper in colors and patterns that coordinated with the rest of my decorations and paper printed with the text of the first Blandings book, Something Fresh, which is in the public domain. The cupcakes are chocolate, made with an organic baking mix from Madhava, and frosted with vanilla buttercream icing. They're topped with naturally-colored pink sugar, which is actually a nod to a different book from the same time period as the Blandings novels--A. A. Milne's Winnie the Pooh, specifically the chapter "Eeyore Has a Birthday." My mother and sister follow special diets and aren't able to share the food and cake, so I like to give them each a small party favor instead. This year I got little bunches of faux roses and retro metal flowerpots from IKEA, and tied on a little tag that read "Rosa 'Blandings' - cultivated by Angus McAllister" in reference to Blandings' roses and cantankerous head gardener. The flowers are only $2.99 and the pots 79 cents, which makes them a pretty and affordable favor for larger parties as well. I also created sets of postcards made to look like vintage British telegrams, since sending urgent messages via telegram is a fairly common feature of Wodehouse's plots. I found an image of a real British telegram online and tweaked it in photo editing software to remove the writing on it, then printed a bunch of them out on cream-colored cardstock:. During the party I played music from the 1930's, but opened with the soundtrack to the Jeeves and Wooster television series, which includes a lot of vintage songs as well as the show's score. 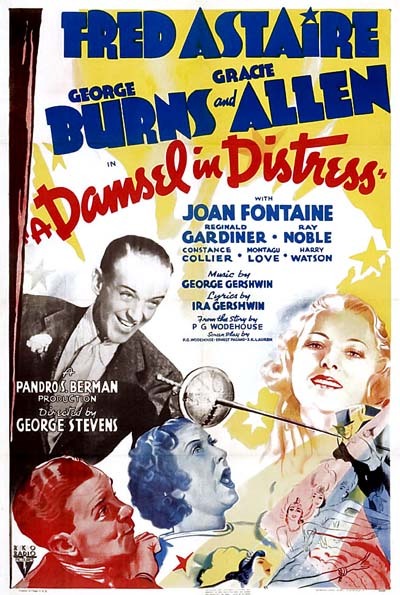 We closed out the night with a viewing of A Damsel in Distress, a fun old movie from 1937 with a screenplay by Wodehouse, based on one of his novels. While neither the film nor the novel are set at Blandings, the plot is typical of many of Wodehouse's books in the series, and there are characters who bear remarkable resemblances to the Earl of Emsworth, Lady Constance, and Mr. Baxter. Music from the Gershwin brothers rounds out the film nicely, and many well-known songs like "Nice Work if You Can Get It" and "A Foggy Day in London Town" are actually from this movie. 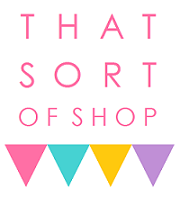 I had a lot of fun putting together this party theme and creating the decorations, some of which I may adapt for future items in my Etsy shop. I definitely want to do more themed celebrations like this, and I can't wait to plan another one!